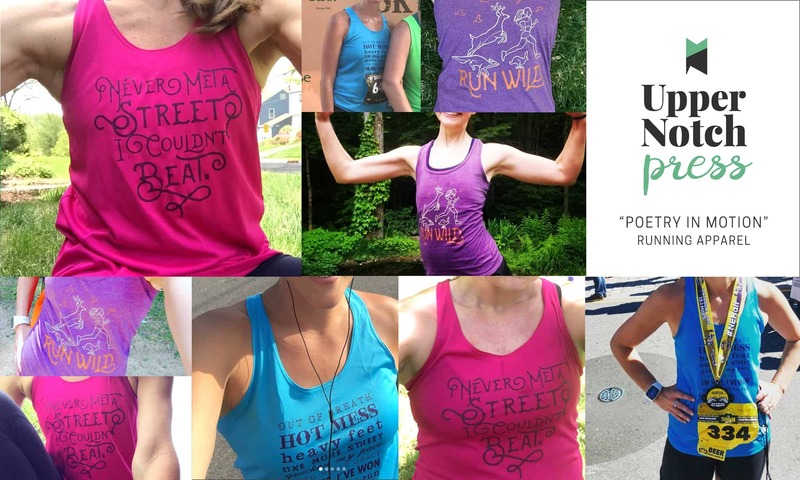 The idea behind our first shirt was to create a fitness tank that had a little more authenticity and originality in its mantra (not that we don’t appreciate the universality of “will run for wine”!). We wanted to put into words some of the passion, pain, and complete sense of accomplishment that we feel as busy ladies (and to be honest, not “natural runners” by any means—read this post for more on that) who try, whenever possible, to make time to run. And like any project we do, we wanted those thoughts to be beautifully, thoughtfully designed. In short, we totally love these shirts for running. Here’s the scoop on each (the inspiration, the art, the fabric, the fit). We hope they bring a little extra poetic motivation to your day the next time you lace up and hit the road. Our very first tank! After much research and first-hand testing, we chose this this lightweight, moisture-wicking racerback shirt, which quickly became our go-to for running. (The fabric is 100% polyester with moisture management/ antimicrobial performance.) There’s no bunching, riding up, or chafing, and it hangs in a loose but flattering A-line fit. The shirt is electric blue with dark purple typography silkscreened on the front. The poem, which came to be on a really long run, reads: “Out of breath. Hot Mess. Heavy feet. One more street. Quicken my pace. Speed meets grace. I’m here, I’ve won. 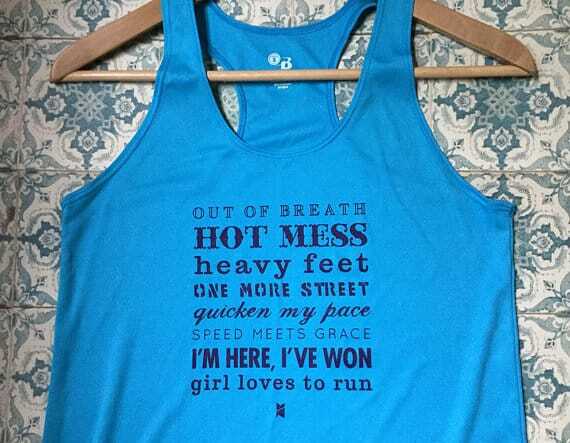 Girl loves to run.” Shop it here. This best-selling running shirt was in the works for a long time. 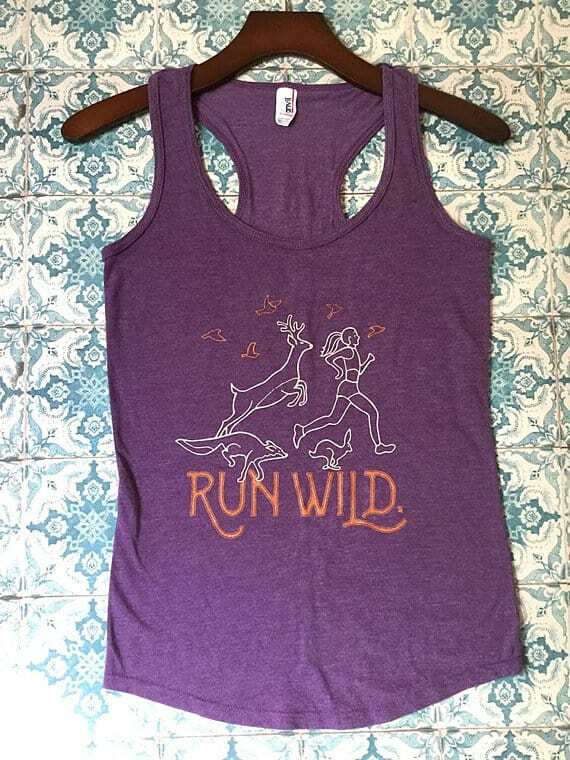 We originally envisioned this artwork for a print, to accompany a different poem, but then inspiration struck to pair it with “Run Wild” as a second running shirt. We drew illustrations of a fox, deer, and rabbit running alongside a woman while birds fly above—a spirited crew doing what nature intended them to…and fast! The illustrations and retro typographic design are silkscreened in burnt orange and beige atop a heathered purple tank top. It feels like a vintage T-shirt you’ve had forever. The fabric is a lightweight, soft blend of combed, ring-spun cotton, polyester and rayon with single-needle bound neck and armholes and a double-needle curved bottom hem. It is racerback, like the other shirts, but the body is more fitted and stretchy (if you prefer a looser fit, we recommend sizing up when you order). Shop it here. 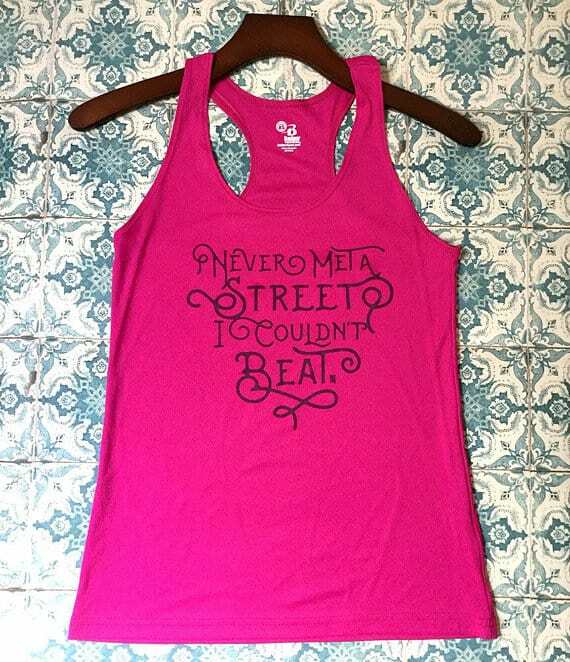 Our third design is a powerful mantra for any workout warrior out there conquering one roads one by one. Once we selected this rhyme (which is actually part of a longer poem we wrote about running), we wanted to find the perfect typography to bring it to life. The elegant, round lines of the letters, silkscreened in dark maroon, play off the strong, punchy words to create a design that is dynamic and beautiful, just like a runner in her element. Printed on the same shirt as the “Girl Loves to Run” tank, the bright pink fabric is 100% polyester with awesome moisture management and antimicrobial performance qualities—it stays dry while you run and washes up perfectly (we recommend laying flat to air-dry). The A-line body hangs comfortably (no cling) and is extremely lightweight, which is especially nice on hot summer days (for a more fitted look, you may want to order a size down). Shop it here.